Description: Cadillacs and Dinosaurs is one of the best beat em up arcade games ever made. Developed by Capcom and released in 1993, this game has a lot to offer. 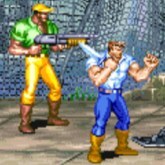 The characters have this fun country style to them while the enemies are a mix of thugs and dinosaurs. Yes later levels actually feature dinosaur enemies which is awesome! You can choose from 4 different characters named Jack (My favorite), Hannah, Mustapha, and Mess. They all are awesome with strengths and weaknesses. While fighting you will find health and weapons you can use laying on the ground. This one is well worth a play through if you are a fan of the genre.